Margaret is the grand-daughter of well known Tryon landscape artist JS Brown. She has been active the the arts for many years including past Vice-President of the Tryon Painters and Sculptors. Her folk art paintings have been chosen for the Williamsburg VA American Art Collection. Margaret is also known for her weaving and fiber art. Margaret has studied oil painting with North Carolina artists Jim Crompton and Andy Braitman. She has also studied with plein air painters James Richards, Kevin Macpherson, Camille Przewodek, Ken Auster and Scott Christenson of Victor Idaho. 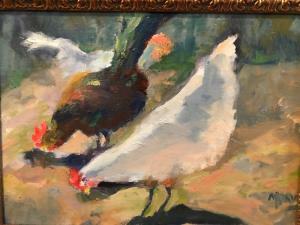 Margaret has taught Oil painting classes for the Tryon Painters and Sculptors.